Convenient Fork Truck Work Platforms Fork Attachment quickly and safely transport maintenance personnel where they are needed. Attaches to forklift by inserting forks into fork pockets and chaining platform to forklift. Tine lock must be engaged to secure platform to forks. 42" high handrail with 21" high mid-rail on three sides. 60" high expanded metal backing on fourth side. 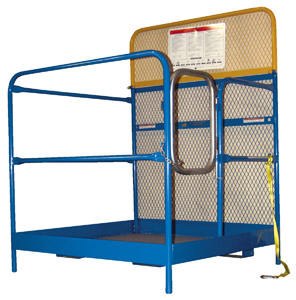 Includes checker floor plate platform and 36" long strap with hook to attach platform to fork truck. The usable fork pockets are 7-3/4"W x 3-3/8"H in rear and 7-3/4"W x 1-7/8"H in front. Capacity is 1,000 pounds. Welded steel construction. Powder coat blue finish. The Full Featered unit include an Emergency Stop Button Kit and Web Lanyard with Safety Harness.See chart below for specs. 36" x 48" 16" 60"
48" x 48" Full Featured 24" 60"